FFR silicone lined flex connector has a SILOFLEX® silicone rubber liner and integral gasket. 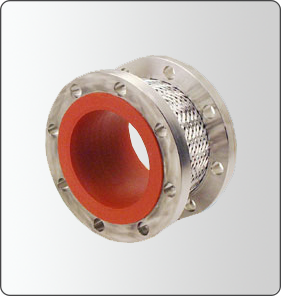 It is constructed with a 300 Series stainless steel convoluted hose, wire braid and 150# ANSI drilled flanged ends. The metal hose convolutes are filled with SILOFLEX® elastomer to combine the sound and vibration dampening qualities of rubber with the higher pressure characteristics and longer cycle life of stainless steel. The SILOFLEX® liner prevents dirt and debris from collecting in the convolutes, which can cause pressure to drop, loss of flexibility, and reduced cycle life. It also redistributes stresses over the interior surface. The system pressure sees the cylinder formed by the SILOFLEX® liner rather than the entire hose inner surface. The entire wetted surface is protected, as the liner extends through the flanges and forms an integral gasket. Friction loss and turbulence are reduced to approximately that of plain pipe; only ¼ that of convoluted hose. The SILOFLEX® insulates and protects the stainless steel hose from chloride corrosion and stress cracking.